Toshiba has swung back into the black in its third quarter lifted by the rising sales of power equipment, higher semiconductor chip prices and a weaker yen. For the three months ended December, Toshiba booked a 29.3 billion yen (US$ 322 million) net profit, compared with a loss of 11.5 billion yen (US$ 126 million) the previous year, according to a statement Thursday. The company, which makes flash memory chips, steam turbines and other electronic equipment blamed a weaker global economy for a drag on sales. 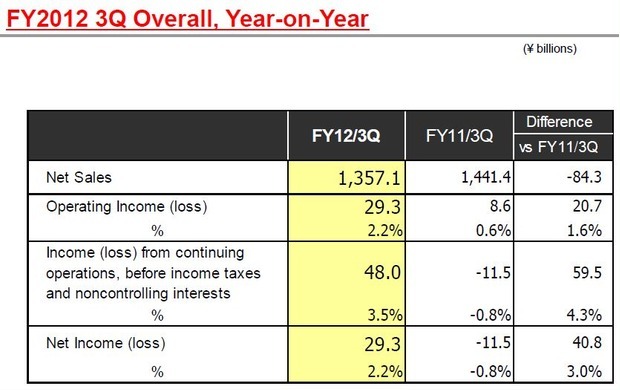 Revenue was lower by 84.3 billion yen (US$ 927 million) at 1.35 trillion yen (US$ 14.8 billion) for the same period. “Although the United States saw a gradual and steady recovery, anxiety persisted about financial uncertainties in Europe, and some emerging economies, including China and India, reported slowdowns in growth rates,” said Toshiba in the statement. The firm warned the Japanese economy would continue to suffer from the impact of slowing global growth, but noted there was some relief with the appreciation of the yen eased toward the end of December. In the third quarter, the company’s electronics devices unit which makes flash memory for Apple devices, more than tripled its operating income to 28 billion yen (US$ 308 million). Bloomberg noted this was boosted by a 9.6 percent rise in the price of 32-gigabit NAND flash memory at US$ 2.86 for the period. It added the price began rising after Toshiba, the biggest supplier after Samsung, cut production in July. Toshiba’s biggest unit, its social infrastructure division, saw operating income rise 38 percent to 15.5 billion yen (US$ 170 million). The unit makes equipment such as thermal and hydropower systems, elevators and medical devices. The company maintained its forecast for a full-year net income of 110 billion yen (US$ 1.21 billion).